As our anniversary drew near, RancherMan suggested we take a short road trip somewhere relatively close to home. We didn’t want to spend lots of money but we wanted a fun, romantic getaway. After much discussion we decided to drive to Granbury, Texas. We’ve been there on several occasions and it’s a fun town to visit. Now when we were younger we’d just seek out the cheapest place to stay. Our rationalization was that we just needed somewhere to sleep, it didn’t have to be nice. Our vacation experience was expected within the daily going and doing anyway. No longer do we stay at budget hotels, oftentimes opting for a nicer but still affordable Comfort Suits with a complementary breakfast for those trips when a hotel room is in order. But RancherMan & I almost always prefer to stay at a Bed & Breakfast when we travel. We’ve found they’re often not much more expensive than just a hotel room. But since they’re often beautiful Victorian homes and include a delightful homemade breakfast, the experience itself is much more enjoyable. 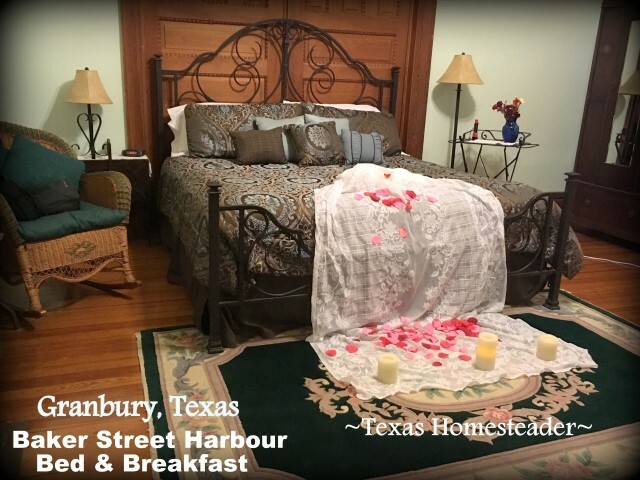 So RancherMan did some research on the area and we decided we’d enjoy staying at the Baker Street Harbour Bed & Breakfast. Even though we often stay at a B&B when we travel, we’ve never stayed at one twice – preferring to experience different B&B’s instead. Except this one. We’ve stayed at the Baker Street Harbour not once but twice in the past! Yeah, it’s that good. When we arrived both owners greeted us outside on the sidewalk. We chatted as we walked into their beautiful home and she asked whether we had any preferences for breakfast. Of course RancherMan & I requested something with jalapenos! LOL. Shortly after we checked in she presented us with chocolate covered strawberries and freshly-baked salted caramel brownies. YUM! We got settled in and relaxed a bit in the spacious Dr. Doyle’s Suite. Then out to the gazebo next to the waterfall to enjoy the view. When we started getting hungry for supper we asked for suggestions. Terry mentioned a place called Stumpy’s that was delicious. But she warned that the locals go crazy for ‘Taco Tuesday’, it would be crowded on this day. So to let the craziness die down a bit first RancherMan & I waited until around 7:30 or so before we ventured that way. Even on a weeknight at around an hour before closing the parking lot was completely packed with no parking spaces. And in the adjoining parking lot? No parking spaces. Even the overflow ‘park your boats & RVs here’ spots around the corner – STILL no parking spaces! Wow. So we skipped Stumpy’s this trip, maybe next time. So we decided to try a placed called Mesquite Pit Steaks & Bar-B Q instead. There were several tables available and we requested a seat outside on the patio overlooking the lake. There was an entertainer singing and playing guitar for our entertainment. RancherMan & I ordered Armadillo Nest appetizer, which consisted of a couple of brisket-stuffed jalapenos nested into a large white onion blossom. Personally I wasn’t thrilled with the tiny stuffed jalapenos. Then we ordered the 2-for$20 entrees, I ordered Mesquite Grilled Chicken Breast and he ordered Chicken Fried Steak. The food was fine, but certainly nothing to write home about in my book. (although the service was great) Then back to our room to relax after a day of traveling. The next morning we enjoyed a very fancy breakfast that included fresh fruit, bacon, sausage, juice, coffee, stuffed french toast, & omelettes. When we were called to breakfast I was delighted to see one of the owners (Perry) decked out in his chef gear, complete with scrunchy chef hat. Breakfast was served family style on fancy plates/chargers and with nice stemware. So RancherMan & I gathered around the table with the other two couples. We introduced ourselves and got to know each other as we enjoyed an incredibly decadent breakfast. Both of the other couples would be heading out after breakfast, but RancherMan & I would be staying at Baker Street Harbor another night. So after breakfast we bid them all a safe journey and RancherMan & I decided to hit the square. Links to all the places we visited will be added at the bottom of this post. 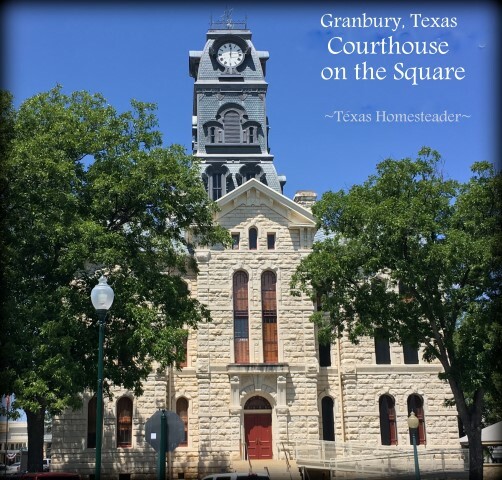 The square in Granbury was like any typical small-town square you might encounter. It was a lovely square of shops anchored by the courthouse in the center. I love the old courthouses, almost all of them include gorgeous architecture and oftentimes a clock at the top too. Love ’em! Now I’m not a big souvenir-buying person. The last thing I want is a whatsit to dust or a garish t-shirt screaming the location of our latest vacation! LOL. But I do enjoy buying souvenirs that depict the taste & feel of the areas we visit. We stopped at 1890 Marketplace which offers infused olive oils and spices. It was delightful seeing all the different flavored oils. I’m a big fan of cooking with infused oils & I have several different flavors at home. They also sold some nice seasonings. So I picked up a bottle of green chile infused olive oil and some spicy seasoning. We also stopped by a shop called The Pan Handle. They were hosting a farmer’s market on this day, with an assortment of fresh veggies, cantaloupe, squash, watermelon, etc. I mentioned that was a super-cool idea and one of the cashiers mentioned it comes from their family’s farm. She helped each patron pick out the perfect veggie for them, even asking if they would be slicing the cantaloupe today or tomorrow so she could recommend the melon of the perfect ripeness! RancherMan & I purchased as our souvenir from this shop a 1/4-lb of passion-fruit loose leaf tea and 1/2 lbs of Southern Pecan coffee. The coffee was specially ground to work best in our percolator. And both were then vacuum sealed for us. Then on to D’Vine Wine where our B&B hostess had mentioned they offer FREE wine tasting to all Baker Street Harbour guests. NICE! I sampled a few of their special wines and decided on a bottle of their Cabernet Sauvignon as my Granbury winery souvenir. It would be nice to pop the cork and enjoy a glass of wine tonight when RancherMan & I stroll to the Baker Street Harbour’s pier on the lake and enjoy a peaceful evening. So to remember our fun trip I ended up with nothing to wash or dust. Just local Granbury fineries to enjoy. What great souvenirs we ended up with! We decided on a late lunch, but what to eat? We saw a Fuzzy’s Tacos right off the square. Now I’ve seen them before in our travels and just never really felt the need to stop there. But since we didn’t get our tacos yesterday, maybe we could grab a good taco today! I ordered a combo plate which included a taco and an enchilada. RancherMan just ordered a couple of soft tacos – one shredded brisket and one California Heat Shrimp taco. He also ordered a draft beer. The enchilada was fine I guess, the black beans needed a little hot-sauce seasoning and the potatoes were good too. But Oh. My. Gosh. OK y’all, now I love me some tacos and I almost always request them at any Mexican-food place we visit. But none. NONE I tell you, have ever been this good! I’ve now found my new favorite taco and will seek it out as often as I can. There are no Fuzzy’s Tacos anywhere near where we live, but when we do encounter them occasionally on our travels. You can bet your boots I’ll be sure to stop by when I see one! RancherMan was equally impressed with his tacos. He said when his tacos arrived in their baskets, he couldn’t even see the tortilla beneath them. They were certainly not skimpy with the fillings here. He especially loved the California Heat taco and the Sriracha-Lime sauce. Folks, both of us were pleasantly surprised with this lunch stop. And for a fast-food place, there was precious little dining waste here. The baskets were reusable of course, and they used real honest-to-goodness flatware too. I always have my travel mug with me for ice water and RancherMan’s beer was served in a frosted glass. The condiments were served in small reusable condiment cups. What a pleasant surprise for this crunchy-green girl! Between a hearty breakfast that morning and our very filling lunch, there was no way we’d be hungry for supper today! So RancherMan & I went back to our room and chilled for a bit. Then when the shadows started to get long and the temps began to cool, he and I walked the short path to our B&B’s double-decker dock and pier at the lake and relaxed on the top deck in the comfy chairs under the stars. We enjoyed some wine as we watched the boats on the lake slowly make their way back to their boat ramps for the night. The lights across the lake flickered gently on the water and RancherMan & I spent the evening talking about our anniversary and our 19 wonderful years of marriage. What a relaxing way to end the day! The next morning we were due to leave and head home. Our hosts indicated since we were the only guests staying with them for breakfast, we could have whatever we wanted for breakfast. RancherMan called the shots on this morning, and he didn’t want fru-fru food. He wanted COUNTRY food! He requested scrambled eggs with jalapenos and salsa, bacon, sausage, biscuits, gravy, orange juice and coffee. It was all served up on nice plates & stemware. No detail was overlooked – such fanciness! Since we were the only guests this morning we begged our hosts to come sit at the table and enjoy breakfast with us. Finally they relented and we all enjoyed the morning very much, laughing and talking and enjoying our meal. These two – they are such great hosts! On the way out we stopped to shop at a couple of antique places, but we were anxious to get home. We were still full from our mammoth breakfast, so we didn’t even want to stop & grab a bite along our 2-3 hour trip home. Then finally… Aaaahhhh – home sweet home again. It’s a wonderful thing to love your home so much that it feels this awesome to drive through that familiar gate. But we both agreed it was an awesome anniversary trip. One we’ll not soon forget! 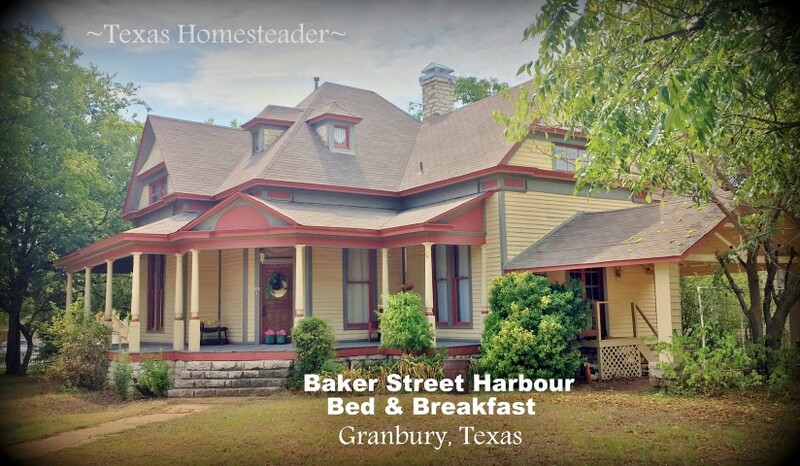 Baker Street Harbour Bed & Breakfast – Bed & Breakfast on the lake. Gorgeous views, fantastic hosts, amazing food. Fresh flowers beside the bed and a gorgeous, comfortable room. No detail left undone. Highly recommend! 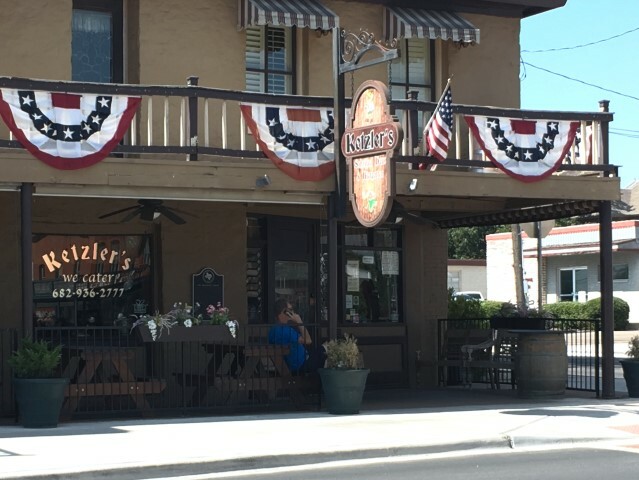 Mesquite Pit Steaks & Bar-B-Q – Restaurant on the lake. Live entertainment, outdoor patio overlooking the lake. The food was nothing to write home about, prices a little much for what you get. Although we had good service and a great view, we probably won’t eat here again. Fuzzy’s Taco Shop – Located on Granbury square. Here’s the real surprise, y’all! These are hands-down the best tacos we’ve ever eaten. Tacos delightfully tasty and filled to the brim with filling. Will go back here as well as their other locations as often as we get the chance! 1890 Marketplace – Flavored Olive Oils & Spices. Lots of deliciousness – fun shop! The Pan Handle – Fun kitchen-themed shop with gourmet teas & freshly-ground coffees. Farmer’s Market onsite when available. Fun shop! D’Vine Wine – Winery on the Granbury Square. Delicious wine, appetizers available also. Great place. 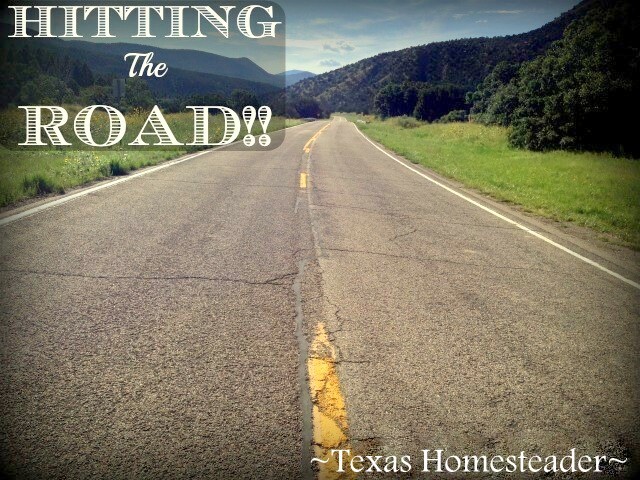 This entry was posted in Blog Posts and tagged Travel on August 16, 2018 by Texas Homesteader. Congratulations Tammy. Did you do anything at the church? It would be wonderful to spend a weekend away. I looked at quilting retreats back in the day……but alas (huge sigh) I seem to be in a hot game of hide and seek and seek the stuffed animals, but if I don’t find ALL of them, she gets to rehide the animals, that I did find. Hmm does that seem fair? But these days won’t last forever. So I’m off to hide and hunt. Sounds lovely, congratulations on a long and happy marriage. I still think you need to come to Oregon this month for the barn party.